"T-ray" redirects here. For other uses, see T-ray (disambiguation). Terahertz radiation – also known as submillimeter radiation, terahertz waves, tremendously high frequency, T-rays, T-waves, T-light, T-lux or THz – consists of electromagnetic waves within the ITU-designated band of frequencies from 0.3 to 3 terahertz (THz; 1 THz = 1012 Hz). Wavelengths of radiation in the terahertz band correspondingly range from 1 mm to 0.1 mm (or 100 μm). Because terahertz radiation begins at a wavelength of one millimeter and proceeds into shorter wavelengths, it is sometimes known as the submillimeter band, and its radiation as submillimeter waves, especially in astronomy. Fine features are revealed by the THz image: THz image, after being processed, gives the same features as X-ray does. Terahertz radiation falls in between infrared radiation and microwave radiation in the electromagnetic spectrum, and it shares some properties with each of these. Like infrared and microwave radiation, terahertz radiation travels in a line of sight and is non-ionizing. Like microwave radiation, terahertz radiation can penetrate a wide variety of non-conducting materials. Terahertz radiation can pass through clothing, paper, cardboard, wood, masonry, plastic and ceramics. The penetration depth is typically less than that of microwave radiation. Terahertz radiation has limited penetration through fog and clouds and cannot penetrate liquid water or metal. THz is not ionizing yet can penetrate some distance through body tissue, so it is of interest as a replacement for medical X-rays. Due to its longer wavelength, images made using THz are low resolution and need to be enhanced (see figure at right). The earth's atmosphere is a strong absorber of terahertz radiation in specific water vapor absorption bands, so the range of terahertz radiation is limited enough to affect its usefulness in long-distance communications. However, at distances of ~10 meters the band may still allow many useful applications in imaging and construction of high bandwidth wireless networking systems, especially indoor systems. In addition, producing and detecting coherent terahertz radiation remains technically challenging, though inexpensive commercial sources now exist in the 0.3–1.0 THz range (the lower part of the spectrum), including gyrotrons, backward wave oscillators, and resonant-tunneling diodes. Terahertz radiation is emitted as part of the black-body radiation from anything with temperatures greater than about 10 kelvin. While this thermal emission is very weak, observations at these frequencies are important for characterizing the cold 10–20K dust in the interstellar medium in the Milky Way galaxy, and in distant starburst galaxies. Telescopes operating in this band include the James Clerk Maxwell Telescope, the Caltech Submillimeter Observatory and the Submillimeter Array at the Mauna Kea Observatory in Hawaii, the BLAST balloon borne telescope, the Herschel Space Observatory, the Heinrich Hertz Submillimeter Telescope at the Mount Graham International Observatory in Arizona, and at the recently built Atacama Large Millimeter Array. The opacity of the Earth's atmosphere to submillimeter radiation restricts these observatories to very high altitude sites, or to space. As of 2012, viable sources of terahertz radiation are the gyrotron, the backward wave oscillator ("BWO"), the organic gas far infrared laser ("FIR laser"), Schottky diode multipliers, varactor (varicap) multipliers, quantum cascade laser, the free electron laser (FEL), synchrotron light sources, photomixing sources, single-cycle or pulsed sources used in terahertz time domain spectroscopy such as photoconductive, surface field, photo-Dember and optical rectification emitters., and electronic oscillators based on resonant tunneling diodes have been shown to operate up to 700 GHz. There have also been solid-state sources of millimeter and submillimeter waves for many years. AB Millimeter in Paris, for instance, produces a system that covers the entire range from 8 GHz to 1000 GHz with solid state sources and detectors. Nowadays, most time-domain work is done via ultrafast lasers. In mid-2007, scientists at the U.S. Department of Energy's Argonne National Laboratory, along with collaborators in Turkey and Japan, announced the creation of a compact device that could lead to portable, battery-operated terahertz radiation sources. The group was led by Ulrich Welp of Argonne's Materials Science Division. The device uses high-temperature superconducting crystals, grown at the University of Tsukuba in Japan. These crystals comprise stacks of Josephson junctions, which exhibit a property known as the Josephson effect—when external voltage is applied, alternating current flows across the junctions at a frequency proportional to the voltage. This alternating current induces an electromagnetic field. Even a small voltage (around two millivolts per junction) can induce frequencies in the terahertz range, according to Welp. In 2008, engineers at Harvard University achieved room temperature emission of several hundred nanowatts of coherent terahertz radiation using a semiconductor source. THz radiation was generated by nonlinear mixing of two modes in a mid-infrared quantum cascade laser. Previous sources had required cryogenic cooling, which greatly limited their use in everyday applications. In 2011, Japanese electronic parts maker Rohm and a research team at Osaka University produced a chip capable of transmitting 1.5 Gbit/s using terahertz radiation. In 2013, researchers at Georgia Institute of Technology's Broadband Wireless Networking Laboratory and the Polytechnic University of Catalonia developed a method to create a graphene antenna: an antenna that would be shaped into graphene strips from 10 to 100 nanometers wide and one micrometer long. Such an antenna would broadcast in the terahertz frequency range. Unlike X-rays, terahertz radiation is not ionizing radiation and its low photon energies in general do not damage tissues and DNA. Some frequencies of terahertz radiation can penetrate several millimeters of tissue with low water content (e.g., fatty tissue) and reflect back. Terahertz radiation can also detect differences in water content and density of a tissue. Such methods could allow effective detection of epithelial cancer with an imaging system that is safe, non-invasive, and painless. The first images generated using terahertz radiation date from the 1960s; however, in 1995, images generated using terahertz time-domain spectroscopy generated a great deal of interest. Some frequencies of terahertz radiation can be used for 3D imaging of teeth and may be more accurate than conventional X-ray imaging in dentistry. Terahertz radiation can penetrate fabrics and plastics, so it can be used in surveillance, such as security screening, to uncover concealed weapons on a person, remotely. This is of particular interest because many materials of interest have unique spectral "fingerprints" in the terahertz range. This offers the possibility to combine spectral identification with imaging. In 2002 the European Space Agency (ESA) Star Tiger team, based at the Rutherford Appleton Laboratory (Oxfordshire, UK), produced the first passive terahertz image of a hand. By 2004, ThruVision Ltd, a spin-out from the Council for the Central Laboratory of the Research Councils (CCLRC) Rutherford Appleton Laboratory, had demonstrated the world’s first compact THz camera for security screening applications. The prototype system successfully imaged guns and explosives concealed under clothing. Passive detection of terahertz signatures avoid the bodily privacy concerns of other detection by being targeted to a very specific range of materials and objects. In January 2013, the NYPD announced plans to experiment with the newfound technology to detect concealed weapons, prompting Miami blogger and privacy activist Jonathan Corbett to file a lawsuit against the department in Manhattan federal court that same month, challenging such use: "For thousands of years, humans have used clothing to protect their modesty and have quite reasonably held the expectation of privacy for anything inside of their clothing, since no human is able to see through them." He seeks a court order to prohibit using the technology without reasonable suspicion or probable cause. Spectroscopy in terahertz radiation could provide novel information in chemistry and biochemistry. Recently developed methods of THz time-domain spectroscopy (THz TDS) and THz tomography have been shown to be able to perform measurements on, and obtain images of, samples that are opaque in the visible and near-infrared regions of the spectrum. The utility of THz-TDS is limited when the sample is very thin, or has a low absorbance, since it is very difficult to distinguish changes in the THz pulse caused by the sample from those caused by long-term fluctuations in the driving laser source or experiment. However, THz-TDS produces radiation that is both coherent and spectrally broad, so such images can contain far more information than a conventional image formed with a single-frequency source. Submillimeter waves are used in physics to study materials in high magnetic fields, since at high fields (over about 11 tesla), the electron spin Larmor frequencies are in the submillimeter band. Many high-magnetic field laboratories perform these high-frequency EPR experiments, such as the National High Magnetic Field Laboratory (NHMFL) in Florida. Terahertz radiation could let art historians see murals hidden beneath coats of plaster or paint in centuries-old buildings, without harming the artwork. In May 2012, a team of researchers from the Tokyo Institute of Technology published in Electronics Letters that it had set a new record for wireless data transmission by using T-rays and proposed they be used as bandwidth for data transmission in the future. The team's proof of concept device used a resonant tunneling diode (RTD) in which the voltage decreased as the current increased, causing the diode to "resonate" and produce waves in the terahertz band. With this RTD, the researchers sent a signal at 542 GHz, resulting in a data transfer rate of 3 Gigabits per second. It doubled the record for data transmission set the previous November. The study suggested that Wi-Fi using the system would be limited to approximately 10 metres (33 ft), but could allow data transmission at up to 100 Gbit/s. Potential uses exist in high-altitude telecommunications, above altitudes where water vapor causes signal absorption: aircraft to satellite, or satellite to satellite. (a) Optical image of an electronic chip. (b) Terahertz transmission image of the chip. (c) X-ray transmission image of the chip. Terahertz has the privilege of being non-ionizing (non-destructive) but the resolution of X-ray is higher. Many possible uses of terahertz sensing and imaging are proposed in manufacturing, quality control, and process monitoring. These in general exploit the traits of plastics and cardboard being transparent to terahertz radiation, making it possible to inspect packaged goods. The first imaging system based on optoelectronic terahertz time-domain spectroscopy were developed in 1995 by researchers from AT&T Bell Laboratories and was used for producing a transmission image of a packaged electronic chip. This system used pulsed laser beams with duration in range of picoseconds. Since then commonly used commercial/ research terahertz imaging systems have used pulsed lasers to generate terahertz images. The image can be developed based on either the attenuation or phase delay of the transmitted terahertz pulse. Since the beam is scattered more at the edges and also different materials have different absorption coefficients, the images based on attenuation indicates edges and different materials inside of an objects. This approach is similar to X-ray transmission imaging,where images are developed based on attenuation of the transmitted beam. In the second approach, terahertz images are developed based on the time delay of the received pulse. In this approach, thicker parts of the objects are well recognized as the thicker parts cause more time delay of the pulse. Energy of the laser spots are distributed by a Gaussian function. The Geometry and behavior of Gaussian beam in Fraunhofer region imply that the electromagnetic beams diverge more as the frequencies of the beams decrease and thus the resolution decreases. This implies that terahertz imaging systems have higher resolution than scanning acoustic microscope (SAM) but lower resolution than X-ray imaging systems. Although terahertz can be used for inspection of packaged objects, it suffers from low resolution for fine inspections. 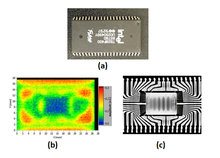 X-ray image and terahertz images of an electronic chip are brought in the Figure on the right. Obviously the resolution of X-ray is higher than terahertz image, but X-ray is ionizing and can be impose harmful effects on certain objects such as semiconductors and live tissues. To overcome low resolution of the terahertz systems near-field terahertz imaging systems are under development. In nearfield imaging the detector needs to be located very close to the surface of the plane and thus imaging of the thick packaged objects may not be feasible. In another attempt to increase the resolution, laser beams with frequencies higher than terahertz are used to excite the p-n junctions in semiconductor objects, the excited junctions generate terahertz radiation as a result as long as their contacts are unbroken and in this way damaged devices can be detected. In this approach, since the absorption increases exponentially with the frequency, again inspection of the thick packaged semiconductors may not be doable. Consequently, a tradeoff between the achievable resolution and the thickness of the penetration of the beam in the packaging material should be considered. NASA has done recent work with using terahertz radiation in the "5-30THz range" to vibrate a nickel lattice loaded with hydrogen in order to induce low energy nuclear reactions (LENR) but has found that generating the radiation using existing technologies to be very inefficient. The terahertz band, covering the wavelength range between 0.1 and 1 mm, is identical to the submillimeter wavelength band. 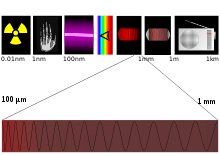 However, typically, the term "terahertz" is used more often in marketing in relation to generation and detection with pulsed lasers, as in terahertz time domain spectroscopy, while the term "submillimeter" is used for generation and detection with microwave technology, such as harmonic multiplication. The terahertz region is between the radio frequency region and the optical region generally associated with lasers. Both the IEEE RF safety standard and the ANSI Laser safety standard have limits into the terahertz region, but both safety limits are based on extrapolation. It is expected that effects on tissues are thermal in nature and, therefore, predictable by conventional thermal models . Research is underway to collect data to populate this region of the spectrum and validate safety limits. A study published in 2010 and conducted by Boian S. Alexandrov and colleagues at the Center for Nonlinear Studies at Los Alamos National Laboratory in New Mexico created mathematical models predicting how terahertz radiation would interact with double-stranded DNA, showing that, even though involved forces seem to be tiny, nonlinear resonances (although much less likely to form than less-powerful common resonances) could allow terahertz waves to "unzip double-stranded DNA, creating bubbles in the double strand that could significantly interfere with processes such as gene expression and DNA replication". Experimental verification of this simulation was not done. A recent analysis of this work concludes that the DNA bubbles do not occur under reasonable physical assumptions or if the effects of temperature are taken into account. ↑ Jones, Graham A.; Layer, David H.; Osenkowsky, Thomas G. (2007). National Association of Broadcasters Engineering Handbook. Taylor and Francis. ISBN 1136034102. ↑ Ahi, Kiarash (May 26, 2016). "Advanced terahertz techniques for quality control and counterfeit detection". Proc. SPIE 9856, Terahertz Physics, Devices, and Systems X: Advanced Applications in Industry and Defense, 98560G. doi:10.1117/12.2228684. Retrieved May 26, 2016. ↑ Ahi, Kiarash (May 26, 2016). "Developing terahertz imaging equation and enhancement of the resolution of terahertz images using deconvolution". Proc. SPIE 9856, Terahertz Physics, Devices, and Systems X: Advanced Applications in Industry and Defense, 98560N. doi:10.1117/12.2228680. Retrieved May 26, 2016. ↑ JLab generates high-power terahertz light. CERN Courier. 1 January 2003. ↑ Virginia Diodes Virginia Diodes Multipliers Archived 15 March 2014 at the Wayback Machine. ↑ Köhler, Rüdeger; Alessandro Tredicucci; Fabio Beltram; Harvey E. Beere; Edmund H. Linfield; A. Giles Davies; David A. Ritchie; Rita C. Iotti; Fausto Rossi (2002). "Terahertz semiconductor-heterostructure laser". Nature. 417 (6885): 156–159. Bibcode:2002Natur.417..156K. doi:10.1038/417156a. PMID 12000955. ↑ Scalari, G.; C. Walther; M. Fischer; R. Terazzi; H. Beere; D. Ritchie; J. Faist (2009). "THz and sub-THz quantum cascade lasers". Laser & Photonics Review. 3: 45–66. doi:10.1002/lpor.200810030. ↑ Lee, Alan W. M.; Qi Qin; Sushil Kumar; Benjamin S. Williams; Qing Hu; John L. Reno (2006). "Real-time terahertz imaging over a standoff distance (>25 meters)". Appl. Phys. Lett. 89 (14): 141125. Bibcode:2006ApPhL..89n1125L. doi:10.1063/1.2360210. ↑ Fathololoumi, S.; Dupont, E.; Chan, C. W. I.; Wasilewski, Z. R.; Laframboise, S. R.; Ban, D.; Matyas, A.; Jirauschek, C.; Hu, Q.; Liu, H. C. (13 February 2012). "Terahertz quantum cascade lasers operating up to ~200 K with optimized oscillator strength and improved injection tunneling". Optics Express. 20 (4): 3866–3876. Bibcode:2012OExpr..20.3866F. doi:10.1364/OE.20.003866. PMID 22418143. Retrieved 21 March 2012. ↑ Ramakrishnan, Gopakumar (2012). Enhanced terahertz emission from thin film semiconductor/metal interfaces. Delft University of Technology, The Netherlands. ISBN 978-94-6191-5641. ↑ Brown, E. R.; SöDerström, J. R.; Parker, C. D.; Mahoney, L. J.; Molvar, K. M.; McGill, T. C. (1991). "Oscillations up to 712 GHz in InAs/AlSb resonant-tunneling diodes". Applied Physics Letters. 58 (20): 2291. Bibcode:1991ApPhL..58.2291B. doi:10.1063/1.104902. ↑ Science News: New T-ray Source Could Improve Airport Security, Cancer Detection, ScienceDaily (27 November 2007). ↑ Hewitt, John (25 February 2013). "Samsung funds graphene antenna project for wireless, ultra-fast intra-chip links". ExtremeTech. Retrieved 8 March 2013. ↑ Talbot, David (5 March 2013). "Graphene Antennas Would Enable Terabit Wireless Downloads". Technology Review. Massachusetts Institute of Technology. Retrieved 8 March 2013. ↑ "Space in Images – 2002 – 06 – Meeting the team". European Space Agency. June 2002. ↑ Space camera blazes new terahertz trails. timeshighereducation.co.uk. 14 February 2003. ↑ "Camera 'looks' through clothing". BBC News 24. 10 March 2008. Retrieved 10 March 2008. ↑ "ThruVision T5000 T-Ray Camera sees through Clothes". I4u.com. Retrieved 17 May 2012. ↑ Parascandola, Bruno (23 January 2013). "NYPD Commissioner says department will begin testing a new high-tech device that scans for concealed weapons". NYDailyNews.com. Retrieved 10 April 2013. ↑ Golding, Bruce & Conley, Kirsten (28 January 2013). "Blogger sues NYPD over gun detecting 'terahertz' scanners". NYpost.com. Retrieved 10 April 2013. ↑ Hidden Art Could be Revealed by New Terahertz Device Newswise, Retrieved 21 September 2008. ↑ Ishigaki, K.; Shiraishi, M.; Suzuki, S.; Asada, M.; Nishiyama, N.; Arai, S. (2012). "Direct intensity modulation and wireless data transmission characteristics of terahertz-oscillating resonant tunnelling diodes". Electronics Letters. 48 (10): 582. doi:10.1049/el.2012.0849. 1 2 3 4 "Milestone for wi-fi with 'T-rays'". BBC News. 16 May 2012. Retrieved 16 May 2012. ↑ Chacksfield, Marc (16 May 2012). "Scientists show off the future of Wi-Fi – smash through 3Gbps barrier". Tech Radar. Retrieved 16 May 2012. 1 2 Ahi, Kiarash (2015-05-13). "Terahertz characterization of electronic components and comparison of terahertz imaging with X-ray imaging techniques". SPIE Sensing Technology+ Applications: 94830K-94830K-15. doi:10.1117/12.2183128. ↑ Hu, B. B.; Nuss, M. C. (15 August 1995). "Imaging with terahertz waves". Optics Letters. 20 (16): 1716. Bibcode:1995OptL...20.1716H. doi:10.1364/OL.20.001716. ↑ Chan, Wai Lam; Deibel, Jason; Mittleman, Daniel M (1 August 2007). "Imaging with terahertz radiation". Reports on Progress in Physics. 70 (8): 1325–1379. Bibcode:2007RPPh...70.1325C. doi:10.1088/0034-4885/70/8/R02. ↑ --, Jerry L. Prince, Jonathan M. Links. (2006). Medical imaging signals and systems. Upper Saddle River, N.J.: Pearson Prentice Hall. ISBN 0130653535. ↑ Marshall, edited by Gerald F.; Stutz, Glenn E. (2012). Handbook of optical and laser scanning (2nd ed.). Boca Raton, FL: CRC Press. ISBN 1439808791. ↑ Mueckstein, Raimund; Mitrofanov, Oleg (3 February 2011). "Imaging of terahertz surface plasmon waves excited on a gold surface by a focused beam". Optics Express. 19 (4): 3212. Bibcode:2011OExpr..19.3212M. doi:10.1364/OE.19.003212. ↑ Adam, Aurele; Brok, Janne; Seo, Min Ah; Ahn, Kwang Jun; Kim, Dai Sik; Kang, Ji-Hun; Park, Q-Han; Nagel, M.; Nagel, Paul C. M. (19 May 2008). "Advanced terahertz electric near-field measurements at sub-wavelength diameter metallic apertures: erratum". Optics Express. 16 (11): 8054. Bibcode:2008OExpr..16.8054A. doi:10.1364/OE.16.008054. ↑ Kiwa, Toshihiko; Tonouchi, Masayoshi; Yamashita, Masatsugu; Kawase, Kodo (1 November 2003). "Laser terahertz-emission microscope for inspecting electrical faults in integrated circuits". Optics Letters. 28 (21): 2058. Bibcode:2003OptL...28.2058K. doi:10.1364/OL.28.002058. ↑ Anthony, Sebastian (22 February 2013) "NASA’s cold fusion tech could put a nuclear reactor in every home, car, and plane | ExtremeTech". ExtremeTech. ↑ "Los Alamos Scientist: TSA Scanners Shred Human DNA". Macedonian International News Agency. 17 December 2010. Retrieved 27 December 2010. ↑ "How Terahertz Waves Tear Apart DNA". Technology Review. 30 October 2010. Retrieved 27 December 2010. ↑ Swanson, Eric S. (2010). "Modelling DNA Response to THz Radiation". Physical Review E. 83 (4): 040901. arXiv:1012.4153 . Bibcode:2011PhRvE..83d0901S. doi:10.1103/PhysRevE.83.040901.